January: Well the year started out pretty badly, because I purposefully beat myself up. Moms, why do we put so much pressure on ourselves?! I spoke about my kids first day of school (the baby and the teenager) and I shared a really easy, no carb breakfast muffin recipe. Because, well, new year, new diet to try stick to. February: We were faced with toddler mayhem (so to speak) as we went about safeguarding our home against the dreaded “puteverythinginmymouthitis”. I had a couple of chats about things like marriage (would you wear a dress that your husband disproves of?) and the perks of having a kid at a young age. Oh and I shared some tricks for curly haired chicks. March: In March I focused a bit on parenting issues like preparing your son for his future wife (apparently it’s a reality you can’t escape) and the interesting Tommee Tippee mouldly sippy cup debate. But then also, it’s my birth month, and I got all emo on you guys, catching all the feelings in the world. I spoke about the 3 reasons why I shouldn’t be alive (here, here and here) and how my life has changed since I turned 30. I mean, I’m not 30 anymore. But that was the point. April: I remember reminiscing about the time that I almost killed my then boyfriend. It was a tragic night. I also dealt with things like friending my work colleagues on Facebook and met a very special car guard that made me change the way I think about A LOT of things! 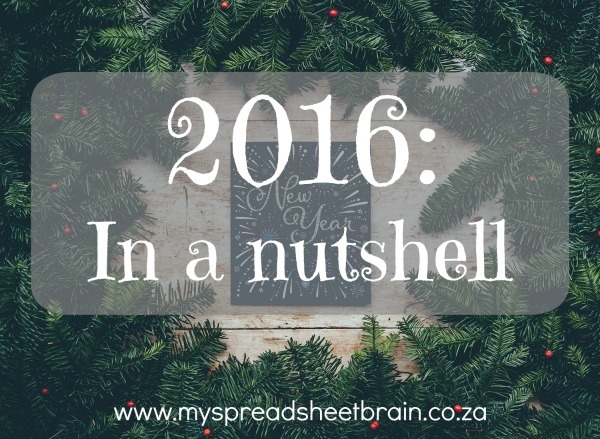 May: As we neared the middle of 2016 I got into a bit of a blogging slump. My Hubstopher had to pep talk me into not quitting. Yeah, it sucked that much. But hey, I’m still here! Whoop whoop! Coincidentally, May saw the start of the #ECMeetUp – the official Eastern Cape Blogger get together! Elle (JustEllaBella) and I got our hearts in a mess when we realized that almost each province had one, except us. So we did something about it! Oh and my Curly’s blood results came back: her thyroid was behaving. A lot of yay’s this month. June: In June I was deeply absorbed in the 7de Laan storyline, and even wrote an article about Tarryn and her obsession with Errol. (No life much?) I think I had a very emo month because I chatted about my grandmother, my issues with being a fake person (me, I was being fake) and I blabbed about how hectic marriage is. Eeyoh, put it away, Luchae, we don’t want to see! July: In July I appreciated how blessed I am to have such a top relationship with Kyle’s dad and step mum. And so I wrote about it. Call it advice, if you will. It hasn’t always been an easy ride, but once us baby mamas get over ourselves, it can be! It was a bit of a random month, and you can totally tell when you read this post over here. August: This month I did A LOT of nail art. Here, here, here and here, to be exact. I really enjoy doing my nails – even though I’m not exactly an expert. But then again, that’s the point! Why can’t you be a normal, 7de Laan watching, pasta cooking mom who happens to do her own nails? You can. I said so. And then, also, I quit my job. So yar, that happened. September: A rant about how challenging CHANGE is! I mean, I did start at a new job after being with my former employee for over 10 years. And then I share about how busy my life is. Oh and we had another #ECMeetUp! That’s (count em) two in one year! High5 to Elle and I! October: We near the end of the year and celebrate my wonderful Hubstopher’s birthday at his super duper awesome Game Show birthday party. I remember feeling frustrated that we were still house hunting (that has since changed, but you’ll read more about it on the blog later on). Oh and there was a lot of dramatics with my Curly Girl, (check out some more curly hair tricks here), as she discovers her own voice. November: We shared the most exciting news in the world: There’s a baby on board! AAACK! I’m due in June 2017 and we are super duper excited. But then also: First trimester blues. You know the deal… nausea, headaches, bloatedness. Doesn’t take away from the excitement though! Oh and how perfect was it that we could make the announcement right before Christmas? My most favorite time of year. I gave away a bunch of gifts, on the blog, to prove it! December: December was just like, a month ago, yo! But it was pretty chilled on the blogging front because life. I did nothing except do my nails, spend time with my girl, soak up the sun and grab some much needed pamper time! I also experimented with make up, but let’s not get into that, hahaha. And here we are, a whole year later. I’m pretty excited for what God has in store this year. I believe that 2017 is the year of #winning. I’ve also made a bunch of (easy) decisions about this blog. For starters, I love the reviews and nail stuff, but I realized that I love chatting about life more and more! Stuff like marriage and how to be a mom without wanting to jump off a cliff while doing it and how to be a better person, sister, daughter, friend. It’s nice to be nice, but it’s even better to be real. I’d love to hear from you guys though. What would you like to see more of on the blog, this year? I know that a bunch of you secretly read my posts (it’s okay, I get it) and you wouldn’t naturally comment. That’s cool 🙂 You could maybe drop me an inbox or an email. I’d really love to hear from all of you. You don’t realize how important you all are to me. I mean, without you, I’d just be over here talking to myself. So thank you for being you and for letting me be me! Here’s to 2017! May it be a year of VICTORY for all of us! Lots of updates on the toddler please… want to know what to be expecting..